Home / Reviews / Household / Essential Oils for Real People! Essential Oils for Real People! Essential oils are so popular now and I think that a lot of people are getting better at using them and spotting ones that are not worth their money. Brands as well as blends are available all over the internet and yet some are not very good. I was so excited to receive a gift set from Plant Therapy to review. There was a great mixture of synergy blends and single essential oils. The whole package made my mailbox smell fabulous. From simple tea tree oil all the way to a relaxation blend, it was a great way to get a sampling of all that Plant Therapy has to offer. (AS STATED ON THEIR WEBSITE) The International Federation of Aromatherapists does not recommend that Essential Oils be taken internally unless under the supervision of a Medical Doctor who is also qualified in clinical Aromatherapy. All cautions listed for individual oils do not include those cautions from ingestion. There are a lot of essential oil companies out there that do not include this information, and I feel this is important to your health and safety and to the safety of your family. The other thing that I really appreciate about Plant Therapy is that they have kid safe oils and they let you know what is safe for kids use and what is not. With my grandkids here in my home I want to be extra careful about what is used on them and around them, with Plant therapy there is no guessing, and no having to do a ton of research into which are safe and which are not. Summer is a time for all kinds of bumps, bruises, bug problems and a lot of outdoor time. I personally would rather use essential oils for these issues than chemicals. Just in my kit alone are some great summer essentials. There are a million more uses, and lets face it some of them just smell fabulous in our diffuser during the summer months. I use essential oils in my home and I know that a lot of you do as well. Plant Therapy has all that you need this season and into the next. Plant Therapy is also having their customer appreciation month during July so be sure to check them out! The quality is outstanding and I think you will find they are incredibly easy to use around kids as the website always has the Kid Safe information. Check out their website and their social media channels to keep up on all of the new uses and specials they have. I use lavender every evening to help me fall asleep. I didn’t know about sweet orange getting rid of flies. I love dropping a few drops of lavender oil on my pillow at night. Helps me sleep really well. What a generous gift. I have a few of Plant Therapys oils and they have good quality and excellent customer service. Plant Therapy Essential Oils Giveaway - Here We Go Again...Ready? I’ve read so much about essential oils and how good they are. I really need to try them myself. Thanks for the review. I’ll check into them! I love essential oils. So far I’ve only ventured trying peppermint and lavender. I would love to try the entire set. I can only imagine how good they smell. I like these essential oils already made up for day-to-day things. 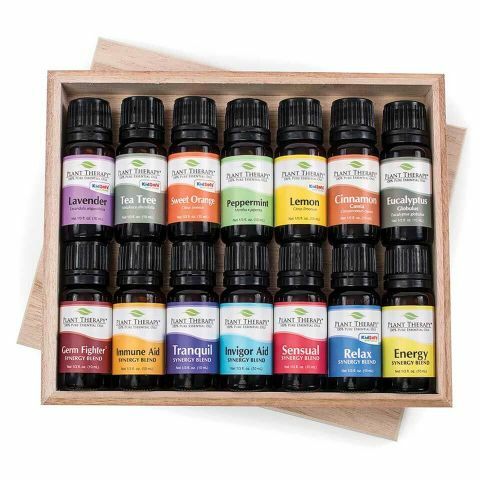 I like the box that holds them nicely unlike how I have my few essential oils. This would make it so much easier. The only thing I don’t like is that it contains two oils that I am highly allergic to. I wonder if they would substitute those two out for something else. I am sure they would work with you! They are a great company!